This post was written by Todd Spiker, author of WTA Backspin, a blog dedicated to the news and happenings of the women’s pro tour. Follow him on Twitter @TheBackspinner. As everyone gathers in New York for the final grand slam of the year, a player’s career could be about to change forever. Then again, that’s no different from the rest of this season, which has unflinchingly pushed forward, making unexpected turns, since the calendar turned over to 2014. Li Na became a multiple slam winner in January but soon parted ways with her coach, and now a knee injury will deprive us of even a glimpse of her at Flushing Meadows. Quick! Who was the other finalist in Melbourne? If you had to think about the answer, well, that says a lot about her season. Pssst … it was Dominika Cibulkova, difficult as that is to remember now. Elsewhere, a Canadian — a CANADIAN — has been the most consistent slam performer all season, while Vika Azarenka’s year has essentially been a bust. Ana Ivanovic has been welcomed back into the elite party she pretty much self-evicted herself from five years ago, while Maria Sharapova has seemingly never left (and it now providing the guests with candy). Simona Halep is currently the no. 2-ranked player in the world, while Venus Williams — again! — is the second-best American. Oh, and about the only woman ranked above both Halep and Venus … well, Serena Williams comes to this U.S. Open with high career stakes. Her year-end no. 1 ranking isn’t yet solidified as she attempts to become just the second woman to three-peat in New York in the last 61 years, Simultaneously, she’s staring down the notion of possibly not only taking home no slam titles in ’14, but also failing to reach a single slam final in a full-participation year at the majors for the only time since she arrived on the WTA scene 16 years ago. 1. Serena weaved her way through the North American hard court circuit, wobbling but winning in Stanford, falling to Venus in Montreal and then taking Cincinnati for the first time ever, playing her best match of the summer in the final against Ivanovic. Serena has found a way to win titles in the “regular season” before in ’14 (a tour-best five times, in fact), but it hasn’t translated to slam success when the pressure was really on. She hasn’t yet advanced past a round of 16 in the majors, and now stands THIS CLOSE to having her first season without an appearance in a slam final since 2006, and just her second since winning the Open in 1999 at age 17. The only year in which she’s played all four slams and didn’t reach a final was her debut season of ’98. History would seem to be on her side to at least advance to the final weekend, right? Maybe, but winning a third straight title might be another matter. It hasn’t happened on the women’s side since Chris Evert’s four straight titles from 1975-78, and you have go back to the early 1950’s (Maureen Connolly 1951-53) to find the last time someone did it before that. 2. Ana Ivanovic has turned a significant corner in ’14, rediscovering her ability to win titles (three) as she’s climbed back into the top 10 for the first time since 2009. She even upset Serena in Melbourne, pushed her to three sets on two other occasions, and outlasted Maria Sharapova in another dramatic three-set affair in Cincinnati that had everyone checking their blood pressure. But the Serb is still looking for her first true deep run in a slam since winning Roland Garros in ’08, having only reached the quarterfinal stage at two of her last 25 majors. Barring an unforeseen early collapse, Ivanovic should be fine to the round of 16, then the Knob of Intrigue will get turned up a few notches. 3. 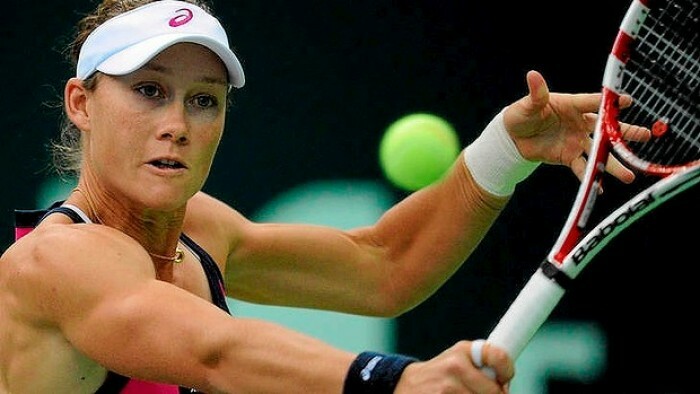 For most of the season, Australia’s Samantha Stosur, the 2011 U.S. Open champ, has seemed a lost cause searching for answers. Briefly, she seemed to find a few over the last two weeks. After losing to world no. 406 Naomi Osaka in the Japanese teen’s main draw tour debut in Stanford, Stosur put up just two games against Serena in Montreal. But she rebounded in recent weeks by battling Williams through two tie-breaks in Cincinnati and riding a week of fine serving stats to the semifinals this week in New Haven, her first final four result since week two in Hobart. If the Aussie could somehow reach the second week she’d be a legitimate threat, but that’s a scenario that’s a big reach for anyone other than a true Stosur fan. For everyone else, it’s hard to envision without calling upon an illusionist. THE BRACKET BUSTERS: Carla Suarez-Navarro of Spain and Coco Vandeweghe of the United States are both are positioned in the same section as Stosur in the quarter. No. 15-seeded Suarez-Navarro and unseeded Vandeweghe are set up for a possible second round match-up, with the winner getting the chance to face the no. 24-seeded Aussie a round later, or to slip through the hole left in the draw should Stosur fail to make it that far. The Spaniard is generally thought to be at her best on clay, but she’s put up a hard court win over Maria Sharapova this summer and took Venus Williams to three sets in the Montreal quarterfinals. The big-serving Bannerette upset Ivanovic and Jelena Jankovic in Montreal and played Angelique Kerber into a third set in Stanford. If Serena has another first week stumble, either woman — both first-time title winners in ’14 — would be in contention for a surprise semifinal run. THE WILD CARD: After a slow comeback from wrist surgery, Italy’s Flavia Pennetta was on the verge of retirement in the middle of ’13, but a good run at Wimbledon was followed up by a first career slam semifinals in New York and everything changed. She grabbed the biggest title of her career in March in Indian Wells, pushing her to within shouting distance of a top 10 return at age 32. She’s had a hard time getting her game back up to speed since, going 10-11. She won just three matches on the North American hard court circuit, with a loss to Serena in Cincinnati sandwiched between tournaments in which she was upset by Yulia Putintseva and Alison Riske. Can the Italian find her fire again in New York, her best slam even before 2013 (three quarterfinal results and that memorable gut-check vs. Vera Zvonareva in ’09)? She doesn’t have a “gimme” draw, with Julia Goerges, Shelby Rogers and Anastasia Pavlyuchenkova likely early-round foes. But if she can get to a round of 16 match-up with, say, AnaIvo and keep playing beyond it, she could still go from crowd favorite to serious threat. THE POOR SOUL: Considering Serena is 55-1 in career first round slam matches, the chances that American Taylor Townsend, the 18-year old wild card, will follow in the footsteps of Virginie Razzano (at Roland Garros ’12) are pretty slim. Still, after a 3rd Round run in Paris this year, whatever happens will be a good learning experience. It’s Serena’s quarter, and likely tournament, to win… but that was the case at the other three slams this season, too. At this point, it would seem prudent to not expect career slam no. 18 to come until 2015. 1. You can pretty much pick the winner of this quarter out of a hat. Yep, this quarter is loaded with big names, but whether it’s loaded with legitimate title contenders is up for debate. Petra Kvitova won Wimbledon, but saw her results sag once again on the hard courts of North America until this past week. She had a great run in New Haven, but playing in the summer heat and in the middle of the daily buzz of New York is a different animal altogether, and the Czech is still looking for her first quarterfinal result there. She could be tested in the third round by Madison Keys. Victoria Azarenka has reached the final in NYC the last two years, but comes to the city seeded no. 16 and nursing a knee injury. How match tough can she be with just eight matches (and three wins) since the Australian Open? 2014 can’t end quickly enough for Vika, so that she can wash the bad memories out of her hair and move onto next season. Svetlana Kuznetsova is the only former U.S. Open champion in the quarter, but she hasn’t reached the quarterfinal in Queens since a run to the final in 2007. Meanwhile, Eugenie Bouchard has been the most consistent slam performer on tour in ’14, reaching two semis and the Wimbledon final. But she’s had a disappointing summer hard court campaign, going 1-3 and having questions being raised about how hard the WTA is pushing her as the tour’s new it girl. The Canadian has been the picture of an even-keeled and confident performer in the slams in ’14, and she’ll have the chance to prove herself again in New York. Bouchard seems to have a good early draw, but she’s just a few matches past having been served a pair of bagels by Shelby Rogers in her home tournament in Montreal, and Ekaterina Makarova (fourth round) has been known to knock high seeds down a peg or two when given an opportunity. THE BRACKET BUSTER: American Madison Keys has shown an ability to gain confidence from her victories and learn from her losses. With ’14 wins over Halep, Kerber and Jankovic, the no. 28-ranked Keys is poised to push Sloane Stephens as the highest-ranked of the young Bannerette corps. Keys doesn’t have an easy draw by any means, as she’s positioned in the same section of the quarter as three slam winners: Kvitova, Kuznetsova and Azarenka. But with all three having their own reasons for possibly disappointing in New York, Keys could slip through to set up a “battle for the hearts of North American youth” in the quarterfinal in a clash between team Madison and Genie’s army. THE WILD CARD: Ten years ago, Kuznetsova became the third Russian to lift a slam title in the ’04 season, taking the Open as a braces-wearing 19-year old with what seemed like an amazing future. She’s had a very good, likely Hall of Fame-worthy (when you factor in her Fed Cup history), career. But she hasn’t become the great champion her talent said she COULD be. But while Kuznetsova is still capable of being ousted in the first round of a slam and surprising no one with the result, the same can be said about her if she put together a deep run into the second week that could potentially put a career-defining THIRD slam on her racket. She’s already “missed” on a trio of additional slam wins in the past, three times failing to convert match points or serve out victories in slam matches against players (Henin, Myskina and Serena) who would go on to win the title. At 29, an age which has come with something of a buy-two-get-one-free deal for many on tour in recent seasons, Kuznetsova has shown “signs” of, well, SOMETHING. A brief return to the top 20, her first final since 2011 and her first title since 2010 have her ranked no. 21 and once again playing the role of Ultimate Wild Card at slam time. She has a rough potential draw: Erakovic in the first, followed by Vesnina, Azarenka, Kvitova and Bouchard to just reach the semifinals. But considering the current fallibility of that entire group, Kuznetsova might not even have to face anyone from that “murderer’s row” other than the Kiwi. Curses! What am I trying to talk myself into? The best story of the women’s draw seems likely to emerge from this collection of talent. I hesitate to say which storyline I’m leaning towards happening, for fear I might curse the outcome. 1. 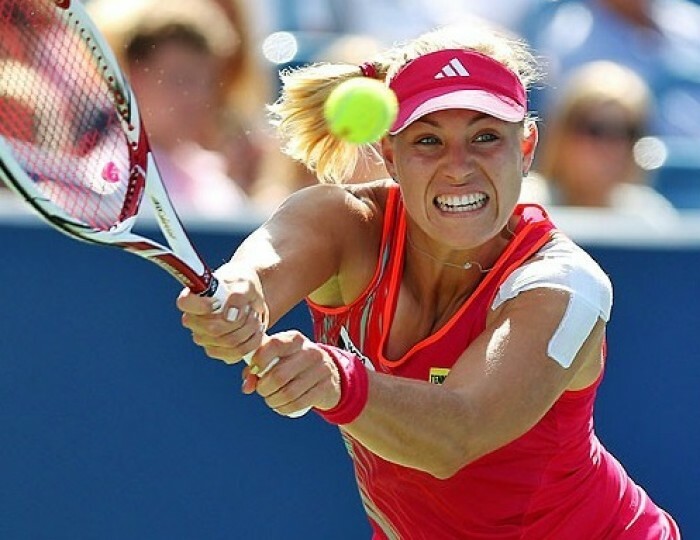 Angelique Kerber of Germany surprisingly emerged in New York in 2011, reaching the semifinals while barely being ranked in the top 100. While she hasn’t racked up singles titles, the German has admirably maintained a top 10 ranking since the spring of ’12, reaching a second slam semifinal (’12 Wimbledon) and reaching at least the round of 16 at 10 of the last 12 majors. She’s never reached a slam final, though. At SW19, she upset Sharapova, only to be caught in the scheduling web of the All-England Club, getting little rest and going out in the quarterfinal a day later to Bouchard. She opened her summer hard court campaign by reaching the Stanford final, and might just end it on another high note, for she has what could be the best draw of any top contender, opening with back-to-back qualifiers in the only quarter that doesn’t sport a former slam singles champion (each of the other three have more than one). 2. With her title run in Montreal, Poland’s Aga Radwanska, seemed to finally turn back the unable-to-finish-anything mojo that began with her loss in the 2013 Wimbledon semifinals. Her “blue period” gave most of her results a sour aftertaste, and the magical quality that went along with watching her take down opponents while reaching into her bag of game day tricks just wasn’t quite as fun. The evil joy of it all might be back … but that doesn’t mean she’s going to put on a deep run at this U.S. Open. She’s never reached the quarterfinals at this slam, and while the draw would seem to set up to give her at least a chance to reach the fourth round again and play for her best Open result, it’s hard to get over the thought that it won’t happen. But even if Lucie Safarova doesn’t trip her up in the Round of 16, Kerber could do it in the quarterfinals. The German is 4-3 against Aga on hard courts, winning two of their last three meetings. 3. Jelena Jankovic is forever in search of what she lost. The former no. 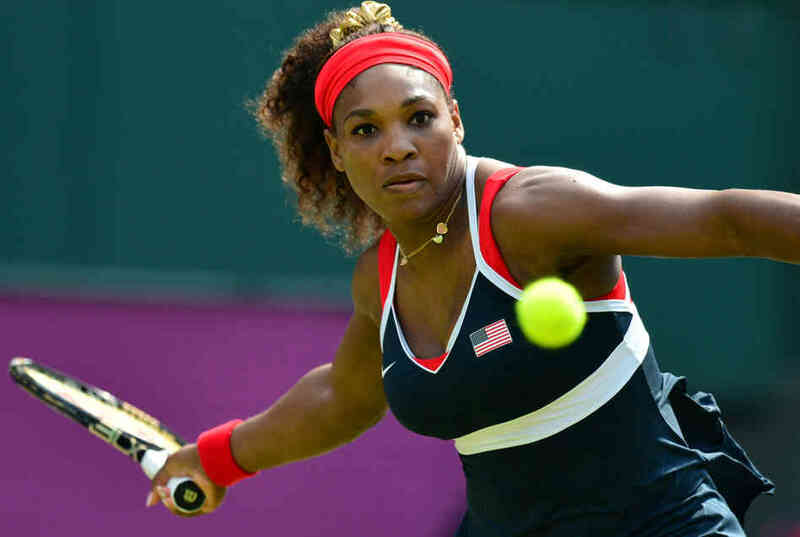 1 reached the U.S. Open final in ’08, playing and losing a tight two-setter against Serena. The Serb has been all over the board ever since. JJ climbed back into the top 10 last year, but she hasn’t reached a slam semifinal since 2010. This Open might just provide her with the best shot she’s had to do it in years, though. If she can get past a first round match against her countrywoman, that is. THE BRACKET BUSTER: Bojana Jovanovski of Serbia comes to NYC on a four-match losing streak, having dropped eight straight sets. And that’s not even her longest losing streak of the season, having survived a six-match skid earlier this year before rebounding by upsetting Azarenka at Wimbledon and reaching the Baku final in July. She’ll face countrywoman JJ in the first tound (1-2 in their head-to-head, she defeated Jankovic on hard court in 2010), with a shot to deliver the first draw-altering upset of the Open. The removal of JJ from the equation would surely immediately set off a firestorm of talk on ESPN about how the “draw has opened up for Sloane.” Of course, as things played out, that wouldn’t likely last long. But, really, it’d be so much more fun to just keep Queen Chaos alive and ticking in this draw for as long as possible. THE WILD CARD: Since (barely) failing to convert match point in the third round against eventual AO champ Li Na in Melbourne, Lucie Safarova has been on something of a grand slam mission. She went to Paris and upset AnaIvo en route to the round of 16 (matching her career RG best), then reached her first career slam semifinal at Wimbledon. This past Monday, Safarova reached a career-high ranking of no. 15. She’s never been beyond the third round in New York, but she put up a win over Venus in Cincinnati and has a draw that seems suited to the Czech setting up a Round of 16 clash with Radwanska, who’s never been to the final eight in New York. A break or two and Safarova might find herself in her second slam semifinal this summer. THE POOR SOUL: A victim of her own success, Sloane Stephens‘ slips are now more noticeable. Coaching changes, a first round loss at Wimbledon, being passed by fellow North American Bouchard on the tour landscape, then countrywoman Venus in the rankings (with Keys not far behind). If future Sloane ever becomes a reality, her birth will be a very public triumph. The blessed event probably won’t happen in New York, though. If she makes it that far, Stephens is slated to face Jankovic in the 3rd Round. She’s already lost to the Serb twice on hard courts this summer. Kerber is the only current Top 10 player without an appearance in a slam final. With ten different finalists at the last five slams, you’d think the law of averages would get the German into one of those championship matches at some point, right? 1. Maria Sharapova, the ’06 champion, SHOULD cast a bigger shadow at this tournament than she actually does. But she’s only reached one quarterfinal in New York since she won the title eight years ago, and ever since her shoulder injury Sharapova has been more of a consistent threat on clay than hard courts. That she comes into the Open after being forced to three sets in five of six hard court matches this summer — losing to Suarez-Navarro and AnaIvo, the latter in the sort of dramatic match that Maria always usually wins — doesn’t exactly speak highly of the form — especially on serve — she’s dragging to Flushing Meadows, either. But, still, even with all that, she’s the favorite in this quarter. A combined 10-3 in her head-to-heads against no. 2-seeded Halep (5-0, including a recent win in Cincinnati) and Venus Williams, Sharapova has lost just once to the latter since 2008. She’s 5-2 against Caroline Wozniacki, too, with the Dane putting up a only one win since 2010. There are pitfalls in this quarter for the Russian, of course, starting in the 1st Round with countrywoman Maria Kirilenko. But Sharapova has to be looking at this draw — with Serena all the way on the other side of it — and thinking, “Yeah, this is doable.” Then again, she probably always thinks that. 2. Maybe the best developing story of this ’14 season has been the re-emergence from the shadows of her condition and all the endless “r”-word talk of a Venus whose game has, at times, looked better than it has in years. Back in the top 20 and having won her first title in two years, Williams’ summer included a run to the Montreal final and her first win over Serena in five years. She hasn’t reached a slam quarterfinal since 2010, and the day-by-day nature of the fatigue associated with her Sjogren’s, even as she’s managed it better and better, still make Venus a question mark over the course of a two-week slam event. But for the first time since before we — and she — finally learned the cause for the lethargy that often engulfed her tennis game a few seasons ago, there’s reason to believe that a deep slam run from Venus isn’t just a fairy tale-like story emerging from one’s imagination and heartfelt desires. It could really happen. 3. Simona Halep arrives with little match play (2-2) on North American hard courts, and one wonders just how much her second straight long season might be wearing down the pride of Romania, especially as she’s likely still being bothered by the ankle she injured in the Wimbledon semifinals. If the world no. 2 can get her teeth into this Open, she might be able to ride her all-purpose game into yet another slam semi, or maybe better. But a reinvigorated Venus would seem to be slated to be waiting for her in the round of 16, and she’s 0-3 against the American. A deep run from Halep at this Open would be good for the game, as it’d be nice to see the Romanian’s low-key personality and reassuring court intelligence/athleticism combo given a proper showcase on the biggest stage the sport has to offer. Not sure if it’ll play out that way, though. THE BRACKET BUSTER: We all KNOW Maria Kirilenko is capable of it. We’ve even seen her do it, in the first round of the Australian Open in 2010. Sure, that’s the only time Kirilenko has converted a match point to defeat Sharapova in eight career meetings (she won a match in’ 05 via retirement), but the all-Russian match-up will surely be one of the most closely watched 1st Round matches at Flushing Meadows because everyone immediately went on upset alert as soon as the draw became public. Thing is, Kirilenko just might not be up to it. After a long injury break, the no. 113-ranked Kirilenko has played just seven matches in 2014, and none since her second round exit at Wimbledon. Even in her few outings this season, though, she’s shown some fight. Still, Sharapova being ousted in the first round in New York for the first time ever would send shock waves through the draw right out of the gate. And when that happens so early in a slam, almost anything can happen next. This is a complicated quarter. What with the issues of the contenders placed here, you get the feeling that the path for the survivor is going to include multiple three-set victories that won’t exactly put them in an advantageous position when it comes time to play for a spot in the final. But everyone might be rooting for them to take it all.